Hernandez, a 38-year-old San Simeon resident, was initially sentenced to 11 years in prison for his role in the burning of a wooden cross outside the home of an African American teen. Hernandez’s early release was due in part to an appellate court overturning two of his convictions. On Oct. 7, CHP officers arrested Hernandez after finding him in possession of a firearm. Hernandez is currently charged with two felony counts of possession of firearm by a felon and unlawful possession of ammunition. He also faces several enhancements to the latter charge. The maximum sentence Hernandez faces is seven years and eight months in prison. During Hernandez’s court appearance Tuesday, Judge Michael Duffy upheld both charges against him. 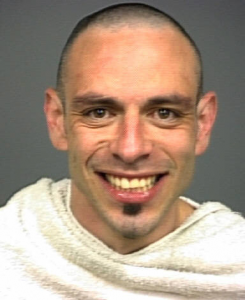 In June 2012, a San Luis Obispo jury convicted Hernandez of arson, terrorism in the form of a cross burning, terrorism in the form of arson targeting a person’s race and conspiracy to commit a crime. Hernandez also received a hate crime enhancement. But, a California appellate court ruled in Aug. 2014 that the convictions of arson and terrorism in the form of arson are not valid when coupled with the cross burning count. The appellate court ordered a local judge to discount the two invalid convictions and re-sentence Hernandez. In Nov. 2014, Judge Jacquelyn Duffy shaved three years off Hernandez’s sentence, reducing it to eight years. However, Hernandez was eligible to be released in late 2015 if he displayed good behavior. It is unclear when exactly Hernandez was released from prison. Terry Thornton, a spokeswoman for the California Department of Corrections and Rehabilitation, said Hernandez was placed on post-release community supervision after he left prison. So….he should be out in 3 months to commit more crimes. Yeah, who wears a towel?